Earn your way to a Ph.D. The McNair Scholars Program is a federally funded TRiO program at over 150 institutions across the United States and Puerto Rico by the U.S. Department of Education. We accept students from underrepresented segments of society and prepares them for graduate school entry. We provide McNair Scholars with the opportunity to work one-on-one with a faculty mentor to conduct a research project. McNair Scholars are in residence at FSU during the summer and a FSU faculty mentor is identified with whom the student will work closely in the execution of the research. In addition, McNair Scholars are provided with GRE and graduate school preparation workshops along with other professional development seminars and scholarly activities. If you would like to receive more information regarding our program or if you are a faculty member at Fayetteville State University and you are interested in mentoring a student, please contact our office. Prospective McNair Scholars must meet ONE of the following criteria: a first-generation undergraduate student with financial need OR an underrepresented (minority) undergraduate student in a doctoral program. Be committed to earning a PhD. within any discipline. The McNair Scholars Program will accept students who want to pursue dual degrees such as MD/PhD., DDS/PhD., or PharmD/PhD. We do not support students seeking to obtain professional degrees such as JD, MD, DDS, or PharmD. See below for the following when submitting your application packet. We only accept hard copies during our recruitment period annually in the fall semester. Please complete the student application form in its entirety. Write a statement describing your educational and career goals from completion of your undergraduate degree through completion of your graduate/doctorate-level degree. Explain what you have done to prepare yourself to meet these goals (courses, work experience, extracurricular activities, etc.) In what ways would you like the McNair Program to help strengthen your preparedness for graduate school? What motivates you to pursue graduate studies? Additionally, outline one or more research interests upon which you would like to focus during the internship period. Why would like to pursue a research project in this (or these) particular topic area(s)? What experience do you have with research? How would your research in these areas fit into your academic or career aims? Personal Statement should be 2 pages maximum. Two sealed and completed recommendation forms are required in your application packet. One of the recommendations should be from a faculty member in your discipline. Recommendation letters are also welcome as well they just would need to be attached to the form and sealed in their own individual envelope and signed across the flap. Recommendation forms may be sent directly from recommender to our office if that is more convenient. Include an official or unofficial college transcript in your application packet. If you are unsure of which forms you need to send, please contact our office. Please do not send us copies of your W2 forms. Make sure your tax forms are signed and dated by the appropriate person. Please fill out the most recent Taxable Income Verification form for needed tax information. Submit a copy of your most recent Student Aid Report (SAR). Include this with your application packet in addition to tax information. If you do not have a current SAR, but filed the FAFSA, please print and sign a copy from your online access through the FASFA website. Again, please sign and date the SAR. In the McNair Scholars Program, you are paid for completing your research project and participating in the program. Scholars receive compensation through stipends. Is the research stipend a scholarship? No, because no service is required from you if give a scholarship. McNair Scholars put in hours on their research projects. Will the payment affect my financial aid? No, the payment is awarded through stipends. Do I have to attend graduate school at FSU? No, McNair Scholars receive fee waiver for more than 200 graduate schools across the nation, and can be accepted all over the nation. What if I want to get a JD, MD, DDS, or PharmD? The McNair Program does not support these degrees. We only support students who want to earn PhDs. We however, will accept students who want to pursue dual degrees such as MD/PhD, DDS/PhD, or PharmD/PhD. No, McNair Scholars may come from any discipline. Will participating in the McNair Program cost me anything? No, it will only cost you your dedication and time. GRE fee reduction waivers and graduate school applications fee waivers. Scholars are eligible for McNair fellowships at universities all over the nation. Computers and other resources are available to scholars to use. We also offer you free workshops, classes and social event with other McNair scholars across the nation. We are here to help you succeed academically. Underrepresented ethnic and racial groups are Black (non-Hispanic), Hispanic, and American Indian/Alaskan Native. The latter is to be documented as an enrolled member of a U.S. federally recognized American Indian tribe or Alaska Native Group, or posses one fourth degree (federally recognized) Indian blood prior to selection. Are part-time students eligible to become McNair Scholars? The requirements state that you have to be enrolled at FSU and hold a full-time status (12 units or more). What if work, family, or other commitments conflict with the summer research internship? There must be a balance between your commitments outside academics and your commitment to furthering your education. you will have to manage your time and energy in graduate school, so we expect you to do the same in the McNair Program summer research internship. May I choose my own mentor? Yes, but we do ask that your primary mentor be a FSU faculty member with a doctoral degree. What should you do before your interview with the McNair Scholars office? Research what program will be most compatible with your interests and abilities. Understand the McNair Program only supports students who want to earn a Ph.D.
Ronald Ervin McNair was born October 21, 1950, in Lake City, South Carolina. Dr. McNair received a bachelor's degree in physics from North Carolina A&T State University in 1971. In 1976, he received his Ph.D. in physics from the Massachusetts Institute of Technology (MIT), becoming nationally recognized for his work in the field of laser physics. Dr. Ronald McNair lived an accomplished life as a research scientist, family man, pioneering astronaut, karate expert, jazz musician and a man of faith. 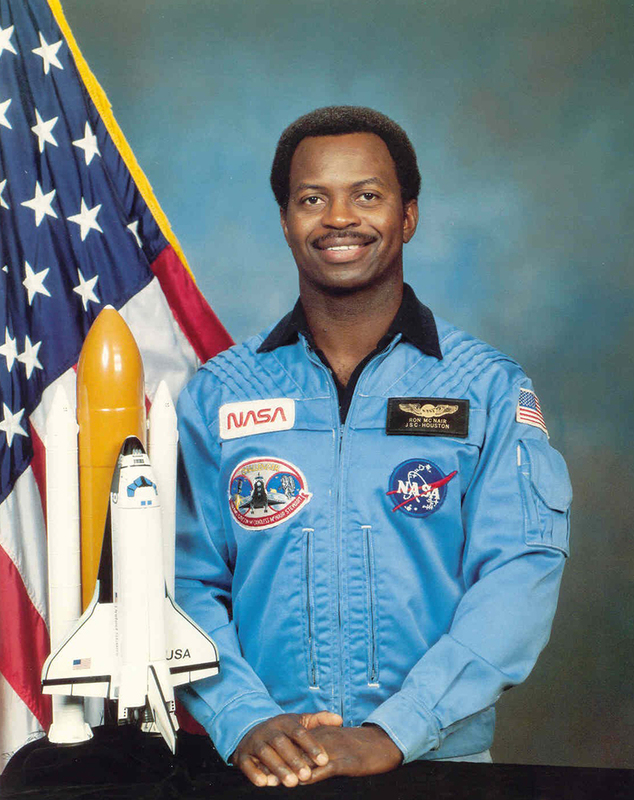 In 1984, he became the second African American to fly in space aboard the STS-41-B Challenger mission. Sadly, on January 28, 1986, the Space Shuttle Challenger exploded after launch from the Kennedy Space Center; he was one of the seven-person crew who died. After his death, Dr. McNair was awarded the Congressional Space Medal of Honor, and members of Congress provided funding for the Ronald E. McNair Post-Baccalaureate Achievement Program. Dr. Ronald E. McNair story serves as a model for people from all walks of life. His story is one that must be passed on from generation to generation. Dr. Sabena Conley, is the first McNair Scholar from Fayetteville State University to earn her Ph.D. As a member of the inaugural McNair Scholars Spring 2010 cohort. Dr. Conley began her pursuit of research under the mentorship of Dr. Shirley Chao. She has since completed her Ph.D. at Virginia Commonwealth University in the Biomedical Sciences doctoral portal Program, with her dissertation project focused on understanding the molecular mechanisms by which hyperhomocysteinemia produces podocyte injury and leads to glomerular sclerosis. This work has been submitted for publication in the Journal of Free Radicals in Biology and Medicine. During her studies, she was named a finalist in APS Renal Section Excellence in Renal Research. In addition, Dr. Conley earned her Master's degree in Biology from North Carolina Agricultural & Technical State University in June 2013. Her thesis defense was entitled "Role of Meprins in the Pathogenesis of Diabetic Nephropathy." At the present, Dr. Conley has started a post-doctoral fellowship at the Mayo Clinic in Rochester, MC under the Kidney Disease Research Training Program. Please contact us if you would like to receive more information or have any questions about the McNair Scholars Program.